Woodburn's Library Square has long been a popular spot, especially during the summer when it hosts outdoor concerts and movies as part of the ""Woodburn Summer Nights program. But the city anticipates a feature to be added this summer that should make it even more appealing: the Library Square Playground. 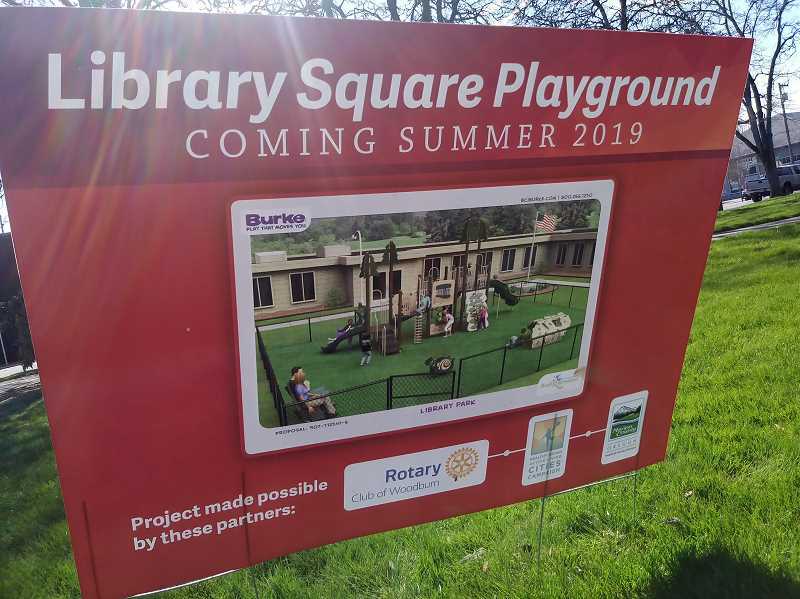 A sign on the Woodburn Public Library grounds at First and Garfield streets depicts a rendition of the new feature, including an activity area with a mix of different play equipment. The feature is expected to enhance not just the park or square, but the library as well. "The idea is to give families an incentive to spend a half a day, or a whole day here at the library," said Woodburn Library Manager John Hunter. "I'm picturing a family spending the morning with the books, programs and computers we have inside the library, and then having a picnic lunch at the new picnic area, followed by an hour or so burning off lunch in the playground." The city of Woodburn salutes several partners in realizing the endeavor: Rotary Club of Woodburn; Healthy Eating Active Living Cities Campaign (HEAL); Marion County Health and Human Services. Hunter additionally salutes Woodburn Parks and Recreation Manager Jesse Cuomo. "I suppose you could say the idea for the playground was mine, and I helped with the overall design, but Jesse Cuomo deserves all the credit in terms of procuring bids and grants and bringing the vision to reality," Hunter said. "Really, Jesse did all of the heavy lifting." Cuomo said he's not sure how long the idea has existed conceptually, but planners started pursuing the project in earnest last June. While the idea was solid, the project did require some finagling. "Some hurdles (included) just finding a vendor that could meet the want and need to do a partial community build -- and stay within a price point we were able (pay) with the funding available," Cuomo said. To that end, the above mentioned partners were crucial, as was the Oregon Public Health Institute and Keizer Permanente. "We have received grant funds from, Marion County, Woodburn Rotary and OPHI Oregon Public Health Institute through the HEAL Cities Grant," Cuomo explained. "Each partner has played a roll. Marion County made it possible for us to afford the artificial surface that will be at the site," Cuomo said. "This will be the first non-manufactured wood fiber playground surface in Woodburn, which will allow for low maintenance along with a safe level surface for all ages and abilities. "Woodburn Rotary, along with being a partner in funding, will be helping lead the community build that has made this project more affordable -- allowed us to do it," he added. Each entity was happy to help out as the overall project coincides with each one's purpose and vision. "This is a great project, and is the signature project of our current president Paul Iverson," said former Rotary President John Zobrist. 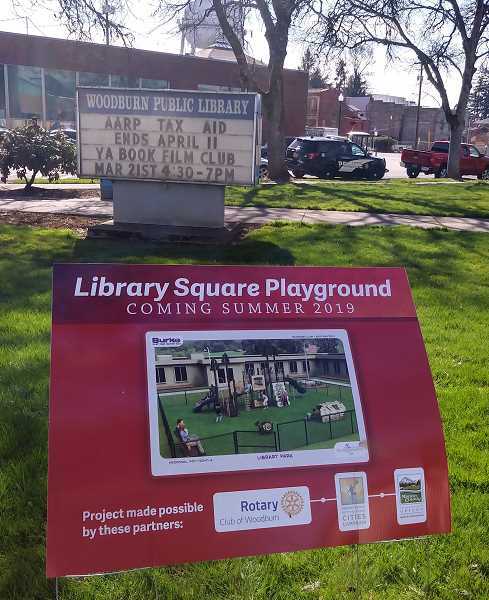 "Woodburn Rotary is proud to be a partner with the city on the library square project," Iverson affirmed. "We will be providing money for the project as well as labor from our members installing the equipment. This keeps with Rotary's mission on supporting local communities." Jamie Nash, a project manager with Oregon Public Health Institute, highlighted Kaiser Permanente's principle benefaction to HEAL Cities Northwest Campaign, which furnished a grant for the project in December. HEAL awarded similar grants for municipal projects in Mount Angel, Tigard, Scappoose and Salem. "We are really thrilled to be able to fund projects in six cities across the state as part of the HEAL Cities Northwest Campaign, with support from Kaiser Permanente, and to help, even on a small scale, increase residents' access to outdoor activities in Woodburn." Nash said. Nash noted that HEAL grants issued for several municipal projects slated for January 2019 through January 2020. Those include installation of bilingual trail signs, building playground structures at heavily trafficked parks and water bottle filling stations near parks. Each project coincides with HEAL's mission to help "harness the power of local governments to advance health and equity through resolutions with policy goals for general plans, land use, healthy food access and work site wellness."